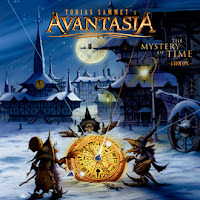 Rock & Metal 4 You: CD-Review: Avantasia - "The Mystery Of Time"
He did it again: three years ago mastermind Tobias Sammet (Edguy) announced the end of his metal opera side-project Avantasia, but now he is back with a new album and an amazing new "cast" of guest musicians. Can Sammet fulfill the big expectations of his fans this time? To get straight to the point: yes, he can! After a few listenings I'm still totally blown away, but I'll try to analyze this record as objective as I can. Everybody should already know that "The Mystery Of Time" is an album with a conceptional story, where each guest singer "plays" a certain role. This time the story focuses on the reason why time passes by so quickly. It's a typicall fantasy plot, which takes you on a fantastic journey to so many emotions and feelings, packaged in a true rock epic. Let's start with the production: it's just outstanding. Sasha Paeth did an amazing job again. He gives each instrument and each musician enough space to breath and to shine on this record. You can listen to "The Mystery Of Time" for so many times and you'll always discover something different in this fantastic arrangements of all songs, which are highlighted by this first class production. What immediately stands out here is the real symphony orchestra! "Spectres" starts with powerful orchestration and it takes the song to another level. You really hear that this is a real orchestra. The opener is one of those typical Avantasia epics with tons of harmonies, change of pace and remarkable chorus. It's a great track, who leaves you hungry for more. "The Watchmaker's Dream" is another gem - just a great feel-good-power metal song, where Joe Lynn Turner (ex-Rainbow) go to the extreme of his lungs. I've listened to so much ballads of this guy, so it's really incredible to hear him rock out here. Arjen Lucassen delivers also a terriffic guitar part on this one. Well done! Next song "Black Orchid" is more dramatic with its pounding orchestra parts, while Sammet and Biff Byford (Saxon) sing to the bet. This song has some superb harmonies in it and is crowned by a catchy, epic chorus. Speaking about Tobis' performance I just can say it's still a matter of taste. I like his singing style. He has a very unique voice, but if you are one of those, who don't like his voice you won't be happy with this album. "Where Clock Hands Freeze" starts smooth, but develops very quickly to a power metal song with a chorus, which is out of this world. A true hymn, ennobled by the majestic voice of Michael Kiske (ex-Helloween, Unisonic). With "Sleepwalking" we find the typical radio-friendly ballad (and first single) on this album, but don't be affraid: this is also a little gem, sung by Tobi Sammet and Cloudy Yang, even if it has lots of pop-appeal. The next song "Savior In The Clockwork" is the first longtime-track. In 10 minutes we get so many different arrangements, remarkable moments, melodies and so on ... the whole song is a journey for itself. Turner, Byford, Kiske and Sammet deliver outstanding performances and for sure we get another stunning chorus, which leaves you a smile on your face. "Invoke The Machine" is another straight-forward rocker with the fantastic Ronnie Atkins (Pretty Maids) on vocals. He is still one of the best singers in this genre and delivers one of the best performances on this album. I would have liked to hear him on more tracks. This song is the hardest track on "The Mystery Of Time". From the hardest one we get to a beautiful power ballad, called "What's Left Of Me" with Eric Martin (Mr. Big) on vocals ... and I fell in love with this piece of heaven. Martin has an amazing vocal range and he really sings his heart out here. Just a perfect song with a beautiful chorus, which takes you away from your daily problems. This is the best proof: music IS magic. With "Dweller In A Dream" we get another hard rockin' tune with Kiske and Sammet on vocals. This is the only song, which is not so remarkable because there ain't any surprises in comparison to the other ones. But it's still a very good track. "The Great Mystery" closes the album in a really terriffic way. Ten minutes pure magnifience ... the grand finale, where you will experience all the emotions you had before. This song lives from the outstanding, warm voice of Bob Catley (Magnum) and great guitar parts by Bruce Kulick (ex-KISS). This tune offers again amazing orchestra parts and a chorus, which could have been part of a fairy tale. By the way this track reminds me a lot at the first two Avantasia albums. So, after analyzing this album step-by-step I just can award the highest score for "The Mystery Of Time". Thank you Tobias for this stunning piece of work. Music IS art and "The Mystery Of Time" a true masterpiece. It combines so many elements of Power Metal, Classic, Hard Rock, Symphony Metal and more and makes it its own. There is so much variety on here, it never gets boring. This is due to the first class musicians, who always left their own note. I have nothing to complain about and that's very, very rare. 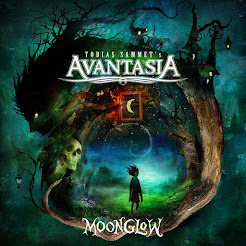 Tobias Sammet has proven once again that he is one of the best songwriters on earth, when it comes to Rock and Metal and his new album is one of those records you get once in ten years. I had very high expectations and they were all exceeded. This is a MUST-BUY for each one of you! I think you won't find something better this year!